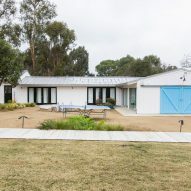 US firm Bestor Architecture has overhauled rundown buildings in an exclusive southern California neighbourhood to create a spacious, beach-style residence for musician Mike D from the Beastie Boys. 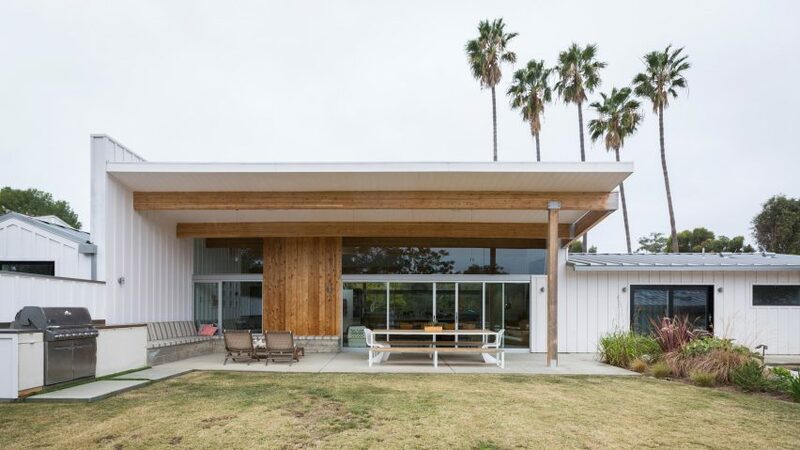 The Malibu Beach House is located in Point Dume, a promontory that juts out into the Pacific Ocean. Known for its scenic beaches and rocky coves, the exclusive area is dotted with a variety of homes, from ranch-style dwellings to sprawling estates. Other celebrities who live on the peninsula include musician Bob Dylan and actress Julia Roberts. 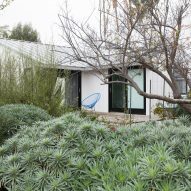 New York-born rapper Mike D – or Michael Louis Diamond, who cofounded hip-hop group the Beastie Boys – discovered a large, flat property in Point Dume that contained a rundown three-bedroom house and several guest cottages. His aim was to preserve the buildings, but update them to accommodate an active family that loves the beach. He, his wife and two children formerly lived in central Los Angeles. 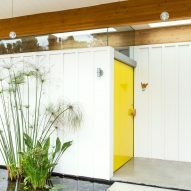 "Mike D enlisted architect Barbara Bestor to devise a haven that celebrates the best of California living," the team said. "His goal, rather than tear down the buildings, was to unite and logically connect what had become a hodgepodge of nondescript buildings." 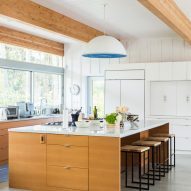 Architect Barbara Bestor, who started her eponymous LA-based studio in 1995, worked together with the client whom she had known for years to devise a renovation plan that would result in a contemporary, beach-style home. The Bestor team handled the architecture and collaborated with Mike D on the interior design. 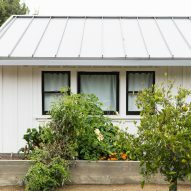 For the main dwelling, an existing gabled roof was removed and replaced with a standing-seam metal roof. 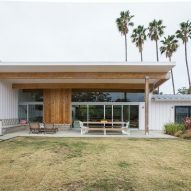 The white board-and-batten siding on the exterior walls was retained and refurbished. "The main house was formerly closed off and had small rooms," the team said. 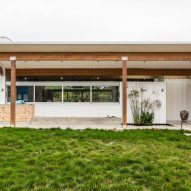 "Barbara's solution was to raise the middle portion of the house, creating an entirely new great room, with radiant flooring, that opened up completely to the terrace and lawn." The same board-and-batten treatment on the facades was used indoors, and timber roof beams were left exposed. 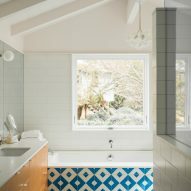 Ceilings were punctured with skylights that enable natural light to bathe the interior. 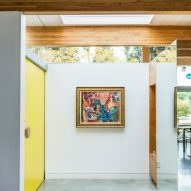 Floor-to-ceiling glass brings in additional light while enabling outward views. 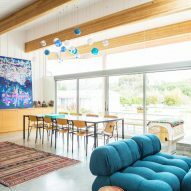 Concrete flooring and white walls create a subdued atmosphere that is enlivened with pops of colour. 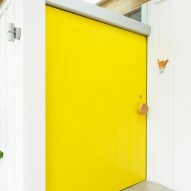 An oversized front door rendered in bright lemon yellow serves as a dominant feature in the open-plan living area. 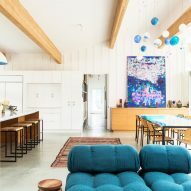 Multicoloured rugs, vibrant artwork and blue furnishings further animate the space. 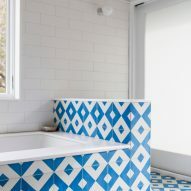 "I love the colour blue," said Mike D in an Architectural Digest video. 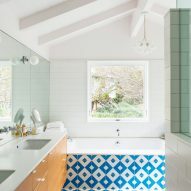 "I always associate blue with the ocean." 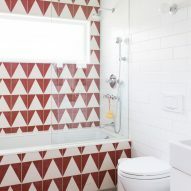 In the bathrooms, patterned tilework contrasts with wooden cabinetry and white-painted walls and ceilings. 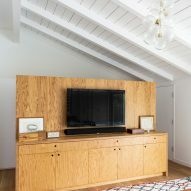 All custom cabinetry in the home was designed by Bestor Architecture, which also designed the "stealth density" Blackbirds housing complex in LA's Echo Park neighbourhood and a colourful headquarters for Beats by Dre in Culver City, California.